Lovely, clean 2 bed 1.5 bath located in local community of Kapaau/Hawi with large wall AC unit and dishwasher. Ocean view, near the community center and local activities like farmer's market with live music. Sit back and enjoy the privacy or head out to the local sites for adventure. The house is fully stocked with towels and lawn chairs. If you are building a dream home in the area and want to stay nearby, this is a great house for you. Or vacation all winter to avoid the snow. Have fun on large lanai deck. We treat this house as our personal vacation spot and have all the amenities we could possibly need and we think you will enjoy them too. We also have orange, lime, pineapple, banana and papaya plants that produce seasonally for you enjoy. Avoid the crowds and stay in Kapaau located near Hawi Town in North Kohala. An artsy, beautiful area still undiscovered. Local sites we enjoy include Hapuna Beach-very clean with white sand, Farmers market beneath the Banyan tree every Tuesday and Saturday, and enjoying the local restaurants, especially Bamboo. Plus go to the harbor on weekends and watch the old dug-out canoe races along with more shops and dining. Please call or email with any questions, we would love to hear from you! We own and operate an electrical contracting business in southern California since 1982. After our first trip to Hawaii in 1988 we fell in love with the island and have traveled there many times ever since. We recently decided to buy several properties, a house in Kapaau, and 2 oceanfront condos in Kona (Kona Magic Sands, which is listed for rent also) and 8 acres in Southpoint, used for raising cattle. We decided to share the Aloha Spirit with others and have never looked back. We have been to Hawaii many times and have fallen in love with the islands. We chose this house in particular because it gives us the local Hawaii without the touristy feel. It is a great size for us and a couple of friends. The house has AC which we love and we keep the vegetation trimmed back to allow breezes and prevent mosquitoes. Air conditioning! Dish washer, lots of beach gear, bbq, local vibe, private house, ocean view, nice community, great to sip coffee on the lani while eating freshly picked fruit and watch the geckos walk by! One Jack/Jill bathroom and one half restroom with access from the living room. Smaller as picture shown but we like to go outside on the decks. Large with front filtered water and ice maker. Anything we would need while vacationing, we bought. Gourmet kitchen with microwave, blender, coffee maker, bean grinder and juicer. Pretty much anything we would want while visiting, we bought for the house. Dine inside or out on the newer large rear lanai. Gardener keeps the vegetation trimmed back to prevent bugs and help the seasonal fruit trees. Located at regional park in town 1 mile away. 55' flat screen HD TV in living room with high speed coax internet, 32' flat screen TV bedroom, camping gear, fishing gear, snorkeling gear, access to King Kamehameha community center with skate park, golf range, tennis courts, pool with diving boards, basketball courts, playground, and barbecue area. Good breeze and not too hot but we like to use the AC and have a new one installed in the living room. Area is green with local shopping and eateries. Aloha for your review. As you know and stated all work and cleaning is done by locals. They are on Hawaii time and they do a good job. As for the dusting when the windows are left open the air will bring in dust as to be expected on the windy side of the island. I have no control over the cabling being plugged in or not allot of guest bring their own electronics and connect to the large TV. If you wanted super clean and daily maintenance service I would suggest the resorts but you will pay $350.00 and day and up along with pool fees and parking. 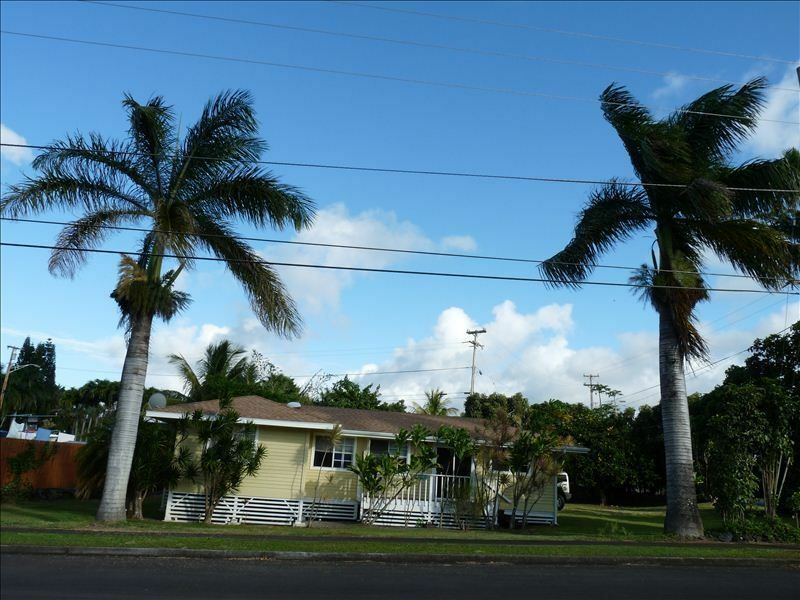 Home is clean with all the amenities you need to enjoy Hawaii or just simply relax in paradise. Homeowner was attentive and helpful with answers to all my questions and my request for late checkout because of night flight. We will definitely be back and maybe even stay at one of their other rental locations directly on the water. Aloha and Mahalo for your kind words. Hawaii will miss you. Unfortunately, this place was not a vacation, but a place we needed to escape our home in the Erupting Lava Zone. This was a great little home away from home, and the new Lanai was fantastic for sitting outside in the yard. I couldn't thank the owners enough for being so accommodating in our situation. They were great! House was very clean with a very well-stocked kitchen, comfortable beds, and big yard with a tasty orange tree. Kapaau and Hawi have everything you need and cute places to visit, and some of the best beaches in the world are a 30 min drive away. We really enjoyed out stay! The property was everything we expected, hoped it would be. You are in a residential neighborhood, on a corner lot. The property is lined with bushes and trees to give you a secluded feeling. Charming place with all the amenities of home! My sister, daughter, and I spent a wonderful week in this charming home! The place was exactly as the posting and owner explained (well, even better) and definitely exceeded my expectations. The owners are SUPER responsive and I felt like I could ask anything I needed. The home was clean, organized, and had everything we needed to enjoy ourselves. The Kapaau and Hawi area were so welcoming and full of friendly people. I felt like I got to see what it'd really be like to live in Hawaii rather than just visiting. The owners gave me plenty of great recommendations (Bamboo Restaurant being one - it was great!) and we stumbled upon plenty of other great finds (Sushi Rock was delicious!). This area of the Big Island is very different - much more jungle/rainy than beachy. It was great for exploring and hiking and seeing a different side of Hawaii. Plus, there are beautiful beaches if you take the scenic drive down the coast. Honestly, I couldn't recommend this place enough. It's everything you look for when renting a vacation home, especially with such friendly, helpful, and accommodating owners! Zip lines through tropical forest and ATV out back private trails with guide. Plus horse back riding. Volcano site seeing and over night camping there with our equipment and camping at Southpoint area on pasture land and see Green Sands beach.